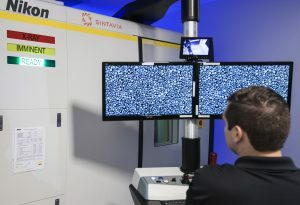 The metal additive manufacturing company Sintavia adds Nikon Metrology CT to its state-of-the-art facility in Florida, USA to further control the additive manufacturing process. Additive manufacturing is making enormous waves throughout every industry. The technology allows ultimate flexibility in creating the most intricate and complex features ever designed for manufacturing. 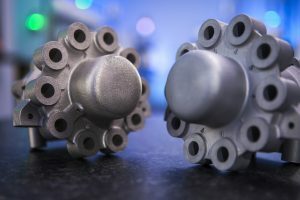 As the technology establishes itself as a vital manufacturing tool for producing ultimately efficient components, companies such as Sintavia have to be ahead of the game. Sintavia is the global leader for independent metal additive manufacturing in industries with precision applications. The additive manufacturing market is constantly growing, and in this climate, Sintavia sets itself apart by providing a full design through-production contract manufacturer. Based in Davie, Florida (USA), Sintavia’s portfolio includes a whole range of equipment. 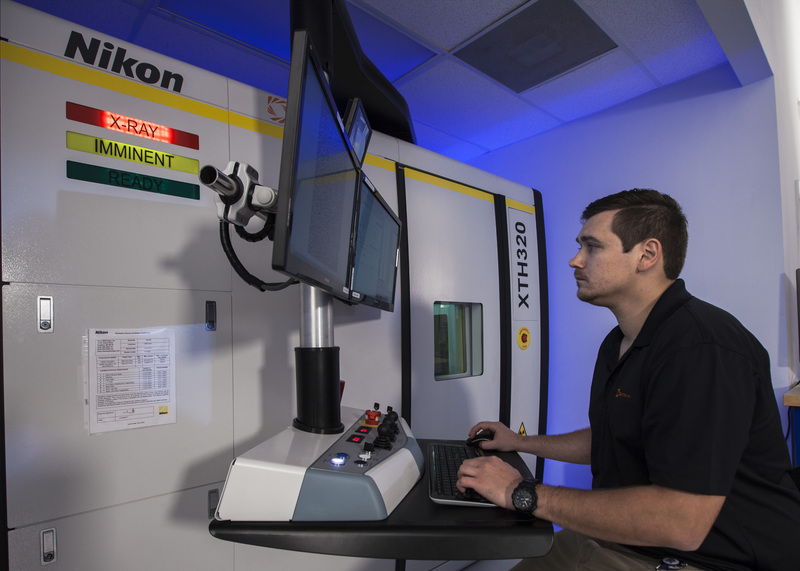 The facility features 8 high speed additive manufacturing machines, as well as post-processing equipment, powder, metrology and mechanical testing laboratories, and various quality assurance tools. Using powder bed fusion (PBF) and electron/ laser beam melting, Sintavia is currently manufacturing with Inconel 718, Inconel 625, Aluminium, Titanium, Cobalt Chrome, Stainless Steel, and other proprietary powders. CT analysis is extremely versatile : external/internal dimensional inspection, compare to CAD model, sectioning in any direction, material and void analysis, etc. 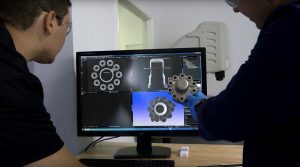 As Sintavia sets itself apart with its beginning-to-end manufacturing, its biggest asset is having full and total control of the additive manufacturing process. Without complete control, you do not have complete understanding of the process. Brian Neff, Sintavia’s CEO, summarizes this by stating, “If you don’t understand and control the process, you won’t build what you want to build”. Typically, both traditional and additive manufacturing faults include microscopic voids and gaps within the structure. These voids can cause stress fractures and reduce the longevity of a component’s lifecycle. To produce the most reliable components for a customer, these must be identified and eradicated. Additive manufacturing allows for very special design features such as conformal cooling inserts, functional integration, complex geometries, lattice networks and hollow members to be produced. These internal designs can only be inspected with CT scanning. Amidst such growth numbers, Sintavia is doing much more than promoting its 3D printing capabilities – it is positioning itself as a full-service, design-through-production provider. In addition to eight high-speed powder-bed metal printing machines, Sintavia’s full post processing department includes a hot isostatic press, vacuum heat treatment, CNC machining, EDM equipment, and destructive and non-destructive testing capability. Sintavia is able to optimize parameters, serially manufacture, and audit quality much faster than any of our competitors.” – Brain Neff, CEO at Sintavia. Sintavia metal AM parts are used in important industries, including aerospace & defense, oil & natural gas, automotive, and ground power generation. Previously, Sintavia relied on external measurements. It was very successful for line-of-sight, however not so much for capturing passageways and chambers produced through additive manufacturing. Sintavia decided to invest in the latest CT scanning technology to achieve the desired level of quality control required for precision industries. As a manufacturing company that excels in all aspects of the process from start to finish, it was obvious that Sintavia needed to invest in a CT scanner. Other companies often outsource the CT scanning inspection and verification but as a global leader in independent metal AM, the final decision was taken to invest in the technology. To have in-house CT scanning capabilities enables quick inspections and allows full control over the quality of product. As an independent metal AM company, Sintavia handles a lot of varied requests and requirements for the components it produces. Throughout aerospace, automotive, and oil & gas industries, Sintavia produces a broad spectrum of parts for various companies. There is an enormous amount of responsibility on Sintavia to manufacture components without error, and micro CT is the only way to gauge if parts are being manufactured correctly. Sintavia technicians understand the importance of inspection and process verification in quality control. Manufacturing standards are the highest in aviation, Neff says, driving the need for a quality control process that is robust and repeatable to clearly demonstrate and improve part quality. It is essential to know whether voids or inclusions are present, how large they are (both individually and in total), where they occur – and also whether the dimensions of the part conform to those of the design. In such cases, X-ray computed tomography (micro CT) is a powerful answer, and Sintavia has installed a 320 micro-focus CT system from Nikon Metrology. By converting 2D pixels to 3D voxels, supplying a full 3D density map of the samples, micro CT gives all this information in an easy-to-read visual format. The micro-focus CT system allows to visualize individual metal powder particles. Micro CT can determine the cooling and flow channels built in by the ALM process to an accuracy of 50μm to 100μm (depending on acquisition parameters). Micro CT can find defects within samples down to a resolution given by the number of pixels across the detector. Given a sample 100 mm across, and a detector 2,000 pixels across, the limiting resolution would be 50μm. Resolution is also limited by the focal spot size of the X-ray source, which may range from 80μm for high energies down to less than 1μm for low energies. The size of sample that can be scanned with CT depends on the material it is made of and the energy of the X-ray source, measured in kilovolts (kV). Larger lower density samples can be scanned, as can smaller higher density samples. Striving for total understanding in anything is the process of the scholar, the visionary, and the insightful. With the rewriting of the manufacturing rules book that 3D printing brings, X-ray CT is a powerful partner for non-destructively assuring geometrical and tolerance quality control. Discover more about Nikon Metrology CT solutions. Learn more about how CT is the optimal solution for evaluating additive manufactured components.